Bloomberg: Barclays’s Michael Rake to Become WorldPay Chairman in September. See WorldPay at FinDEVr this October. Lendio Integrates with Intuit’s Quickbooks. PaySimple introduces BookSimple, its cloud-based scheduling software. Check Point partners with Vmware partner to bolster security in data centers. Boston Business Journal: peerTransfer to open office in Shanghai, China, this year. Bank Innovation reviews Narrative Science and its plans to enter the robot-advisor market. Let’s Talk Payments interviews Ron Suber, Prosper President. Credit Union Times features Rippleshot CEO and co-founder Canh Tran in its column on fraud detection for CUs. Sang Lee, CEO of DarcMatter, quoted in RIA Biz column on robo-advisors. PYMTNs.com profiles Kreditech as the company pursues Series C investment. Belvoir FCU launches Belvoir Buck$ loyalty program courtesy of partnership with Larky. After being acquired by Prosper in January, American Healthcare Lending has changed its name to Prosper Healthcare Lending. Early Warning’s Authentify xFA wins Gold for Authentication Product of the Year at Info Security’s 2015 Global Excellence Awards. Lighter Capital closes twice as many deals in Q1 of 2015 than it did in all of 2014. On Deck expands small business lending in Canada. Trunomi adds new chief architect, Kartik Venkatesh. Tradier teams up with Apex Clearing Corporation to bring brokerage solutions to digital RIAs. peerTransfer adds 56 new schools to its client base in Q1 2015, bringing its total to 650+ educational providers worldwide. VentureBeat: PayPal brings its One Touch payments to the web. Credit Karma wins gold medal in the Financial Services/Banking division at the 2015 Edison Awards. UST Global and Kony launch new mobile app for Blue Cross of Idaho members. 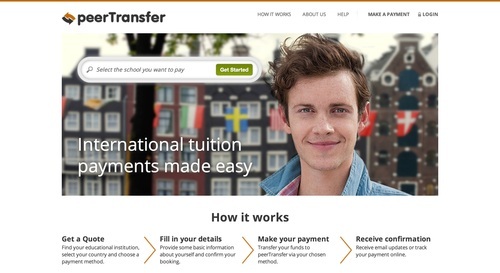 PeerTransfer, a company that makes it easier for international students to pay their tuition bills, should now have an easier time paying its own bills, thanks to a new installment of funding. Today, the Boston-based company brought in a $22 million Series D round led by Bain Capital. Previous investors Spark Capital, Devonshire Investors, Accel Partners, and QED Investors also contributed. The new installment, which almost doubles its previous total, brings peerTransfer’s total raised to $43 million. It plans to use the new capital to expand coverage and penetration at schools in Australia, Asia, Canada, the U.K., and U.S. and advance its payment platform. Matt Harris, Managing Director at Bain Capital, will join peerTransfer’s board. PeerTransfer enables students from 200+ countries and territories to pay their tuition and room & board using bank transfers and credit and debit cards on its payment platform. It is partnered with 600 schools across 10 countries. Since launching in 2009, the company has processed over $1 billion in international payments and is adding 50 new clients per quarter. During the first half of the 2014/15 academic year, it doubled year-on-year revenue and reached profitability. Alex Finkelstein, General Partner at Spark Capital states that peerTransfer is poised for even faster growth and expansion. As for the rest of the academic year, CEO Mike Massaro states that the company is on track to deliver $1 billion in cross-border payments processed for the full year. PeerTransfer recently won the 2014 BostInno’s 50 on Fire Award. It demonstrated its international payment solution at FinovateSpring 2011.